I first learned about Arcadia in an article in Flavor Magazine describing the farm and its related food initiatives. While I didn’t hear about Arcadia until recently, I was familiar with Birch and Barley in my old stomping ground of Logan Circle, DC. The resturant is part of the Neighborhood Restaurant Group that provided the start-up funds for the project and currently sources produce from the farm. After reading the article I was immediately excited and wanted to learn more, but with the beginning of the semester and fall activities ramping up, I wasn’t sure when I would have time to go out to the grounds of the historic Woodlawn Plantation to visit. Until a friend of mine emailed me to let me know that she planned a visit and tour over there and asked if I wanted to come along. How could I say no to a morning out of the office and on the farm talking about local farming initiatives? “Taste me” sign and boots used as containers! In addition to the farm itself, Arcadia’s food initiatives include a mobile market serving low income DC residents and the D.C. Farm to School Network. They are also exploring opportunities to start a food hub and become a farm incubator, providing education to people who are interested in learning to farm themselves. Not only did we get to spend time talking with Farm Manager, Mo, about the farm and the food initiatives running out of Arcadia, we also got to witness expansion of the farm. When we arrived, the tractor just got started on a new area for the farm. Ready to expand! Taking a look at the new space and discussing the cover crop that will go in soon. We were so impressed and inspired by the work at Arcadia, and also the delicious vegetables we got to take home from our visit. It is so exciting to learn about projects promoting sustainable agriculture and local farms while helping to increase access to fresh produce for D.C.
Want to visit and support this initiative? 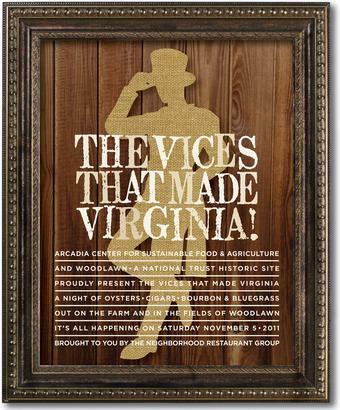 Another exciting event at Arcadia: The Vices That Made Virginia. Thanks to Mo and Arcadia for allowing us to visit! We can’t wait to go back.